If nothing else, learn how to forgive each other, move on, and, if applicable, be better co-parents to your children. The most important thing for a child is to have two parents who know how to co-parent well. For the future of your children, invest 3 days in learning how to be amazing co-parents. There is hope, and I am here to share it with you. Yes, Marriage Helper's mission is to help people save their marriages. But we understand that not every marriage will make the decision to stay together. Sometimes, people choose to divorce. Too often, children are forgotten during the divorce. The parents don't mean to, but many times conflict is high and parents bring the children in the middle of the divorce process. It is so important for your children to have parents that are committed to continue to parent well. The end of a marriage does not mean the end of a family. Some of the couples come to our workshop to learn how to be the best parents they can be to their children, even if the marriage ends in divorce. For all of these situations, there is help and there is hope. But you have to know what happened, how to fix it, and how to do things differently. And we would like to help you save your family, even if a divorce happens. The Marriage Helper 911 Workshop is a blend of tried and true scientific research as well as the best techniques that have actually been implemented into the lives of thousands. In just 3 days, you will learn and be equipped with tools that actually work in marriages facing crisis. These tools have been fine-tuned over 20 years through working with real marriages in real crisis and desperate situations along with using the best research on what makes a strong marriage. Instead of spending months in counseling or even weeks scouring the internet, reading books, or seeking advice from people who are not trained, you can spend 3 days learning these implementable tools that will completely change the future of your family. Actually, one of the things that makes this workshop so powerful is the group educational setting. In one-on-one counseling, people shut down and get defensive. People focus too much on reliving the past and not enough on a better future. At the workshop, we make it a safe place for everyone. We focus on the future. We teach about how you can identify what happened in the past and move on. How to Fall in Love: Our 4-step process called “The LovePath” will teach you how people fall in love and how people fall out of love. We teach you how you can use this to rescue your marriage, even if only one person follows it. If an affair has affected your marriage, a powerful section covers how affairs happen and how they will end, as told by people who have experienced affairs personally. We won't twist your arm to stay in this marriage. This information is helpful no matter what happens. Help You Find Peace: Some people who attend the workshop are trying to decide whether or not they want to save their marriage. 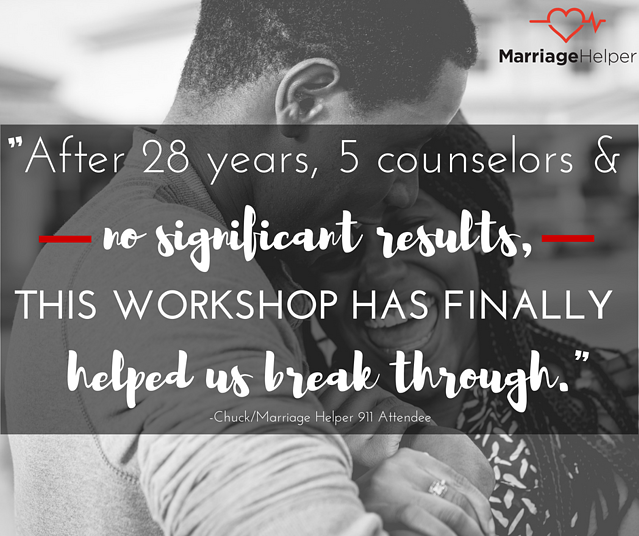 During the workshop, you will learn the things you need to know so that you can have peace about whatever decision you make moving forward in your marriage. Tools to Stop Conflict with Your Spouse (if nothing else, helps you coparent better): You will receive an in-depth assessment that will give you the road map you need to transform the way that you and your spouse communicate. Instead, you will actually learn how to resolve conflict so that both of you can win the argument! Leave with New Hope and New Plan for Going Forward: At the end of the workshop, you will have a game plan for how to move forward with your marriage. You will understand more about yourself, and you will have a new hope for the future. Other topics include how to handle anger, how to forgive, how to take your marriage to the next level by sharing mutual goals, doing the right thing, and much, much more. Not only will the way you interact with your spouse change for the better (no matter what happens going forward) but you will regain self-esteem and confidence for yourself. At Marriage Helper, our team understands that marriage can be hard. We get down to real life stuff, the good, bad and the ugly. We don't talk about surface-level, feel good stuff. That doesn't help. We get down in the weeds with real-life situations, addressing principles that people identify with, whether they want to save the marriage or not. We respect everyone. We don't judge anyone for what happened that led to the marriage crisis. We've been there, too. Everyone on the Marriage Helper team has experienced and overcome a crisis in their own marriage. That's why we are dedicated to helping you. 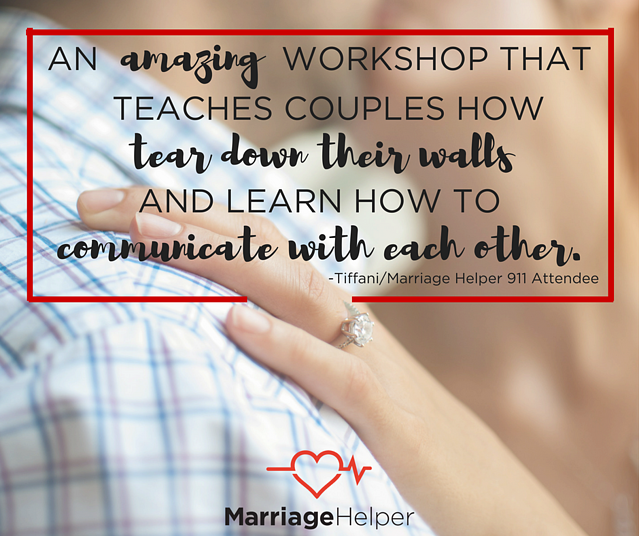 We Would Love To See You At the Marriage Helper 911 Workshop. Contact Us Today. All workshops are held monthly in Nashville, TN. We begin the workshop at 8 am on Friday morning. There will be an hour and a half break for lunch. We plan to end for the day around 6:30 pm. We recommend going out and enjoying the town of Nashville during the evenings! Contact our Customer Relations Advisors to register at 615.472.1161 or by filling out the form. On Saturday, the workshop begins at 8:00 am and ends around 6:30 pm. We break for an hour and a half for lunch. On Sunday the workshop will either begin 1:00 PM and end around 6:30 pm. Great question. We know that you've probably been hurt by others in the past who promise to save your marriage, only to find information that doesn't work or drives your spouse further away. I understand that your hesitant. I hope you understand our heart. 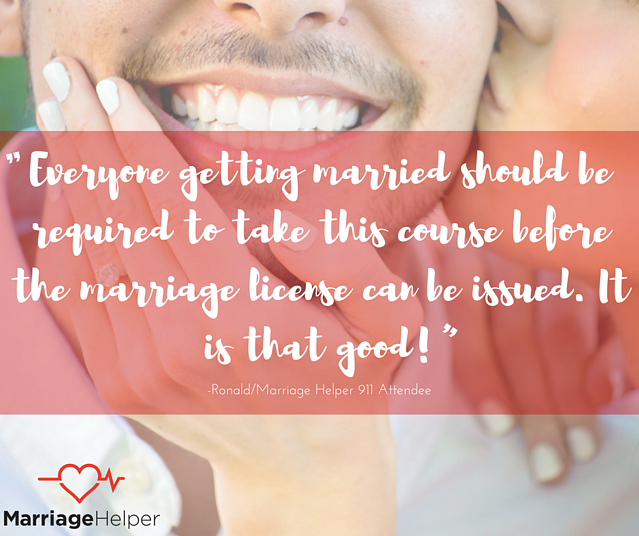 At Marriage Helper, we seek to save marriages and strengthen families by teaching principles that you can apply to your specific situation. Every marriage is different. Therefore, there's no 3-step plan that is going to work for every single marriage. We understand this. That's why we have the Marriage Helper 911 Workshop. It teaches you principles that will work for every situation. Then, when it gets to the nitty-gritty specifics of your situation, we aren't going to leave you hanging. We will do our best to help you navigate the specifics of your situation as well. We've been helping marriages for 20 years. We'd love to help yours, too. Where are the workshops located? The Marriage Helper workshops are held all over America. Click here for the list of dates and locations. If you truly and honestly believed that something would save your marriage, and you are willing to do anything it takes to save your marriage, then couldn’t you find a way to drive or fly? Every month, we have people come to our workshops from places like Canada, California, Oregon, Washington State, Illinois, Montana, even far off places like South Dakota! And yes, we have had couples fly all the way from Guam, Germany, China, and Hawaii. We do! We have an Early Bird Discount available, as well as payment plan options. We will work with you however we can to make sure you can attend. Fill out the contact us form for a representative to call you with more information. Workshops are held in Nashville, TN. Are meals and lodging included? Participants are invited to find their own lodging that is most suitable to their needs. We also have negotiated discounted rates at hotels near the workshop location. We also encourage couples to eat all of their meals together as a time to discuss what they have learned and discovered during the workshop. I can't get to the workshop. There is just no way. Don’t give up! We still have an option for you. You can begin with our online Save My Marriage program. It is for the spouse wanting to save the marriage. For more information, click here. We are already divorced. Can this workshop help? Absolutely. Almost every month, we have at least one couple that is already divorced come to the workshop. In fact, we have had couples come that have been divorced for as long as 10 years! We have experienced many couples remarry from attending the workshop. There hasn’t been an affair, we are just extremely unhappy. Is this workshop for us? Absolutely. This workshop is for many, many different marriage issues, not just affairs. We will address all the ways to rebuild your relationship and fall in love all over again. We will also teach you how to prevent your marriage from ever being affected by an affair. My spouse had an affair and is still in love with the other person. Is this workshop for me? YES! This is the most common problem we see at our workshop, and we have a lot of successful experience in working with these situations. Many people on our staff experienced the same thing in their marriage, and their testimonies will be extremely helpful. I don't know that I can afford the workshop. Then you probably can’t afford a divorce, either. The difference is that, unlike an attorney, we want to help you save your marriage, and we won’t let money stand in the way of that. Fill out the contact us form, and we will contact you and discuss with you many different options to pay for or finance the workshop. You can also get creative! Many of our clients ask for the assistance of family members, friends, their church, and even their employers. We have also had people sell cars, motorcycles and boats. Cut out going out to eat and the cable bill…there’s many different options (including setting up a payment plan). Are the workshops Christian based? Everyone on staff at Marriage Helper holds a Christian faith. Our workshops are based on Christian principles, but we work with couples from all religions and walks of life. Everyone is respected. How do I know if this workshop is for me? Are you willing to do ANYTHING and EVERYTHING it takes to save your marriage or make your marriage better than it is now? If you answered yes to this question, the workshop is for you. What is the difference between you and another similar 3-day program? We invite you to do whichever marriage program you think will work best for you, but we strongly encourage you to not base your decision off of price or location. The old saying is true: you get what you pay for. We have worked with thousands of people and have experienced amazing success rates with our couples. We would love to work with you, too. Can Marriage Helper help me? At Marriage Helper, we have helped marriages in the most hopeless of situations that everyone else has given up on. As we like to say, there's nothing that we haven't heard or seen. And we have STILL seen marriages saved! At Marriage Helper, we believe that everyone deserves respect and care, no matter what has happened or what is going on in their marriage. Where do my funds go? At Marriage Helper, we never turn anyone away because of finances. To help us cover the cost to care for couples who could not afford marriage help otherwise, we put funds we receive from online courses and products towards our Marriage Helper Scholaship Fund for Families. This scholarship funds helps us to help more couples and repair more families who could not have otherwise afforded it.